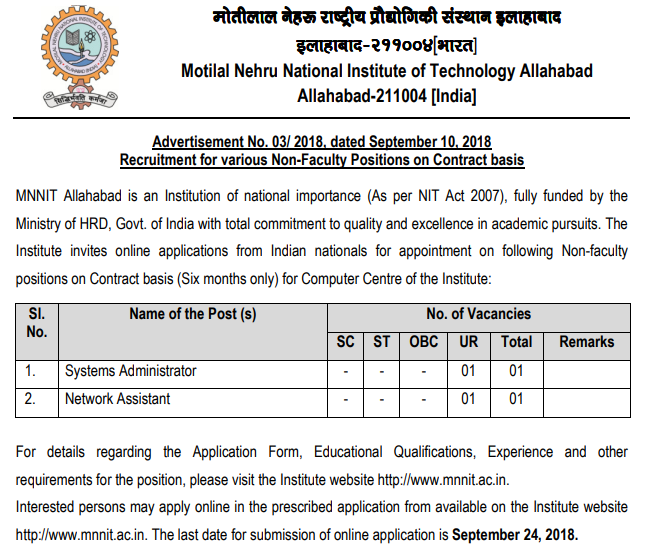 MNNIT Allahabad System Admin & Network Assistant Recruitment 2018: Job Vacancy – From the desk of Motilal Nehru National Institute of Technology Allahabad, on 10th September 2018, Recruitment for various non-faculty positions on contract basis is released under Advertisement No. 03/2018. No doubt, in this latest tech era and for one of the most precious tech institution of the nation i.e. 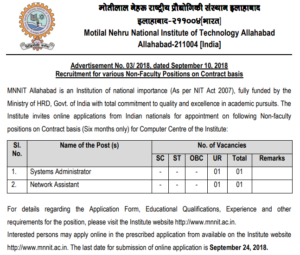 Motilal Nehru National Institute of Technology, Allahabad, Application Forms will be filled online on an official website www.mnnit.ac.in and the last date to apply online will be 24th September 2018. While undersigning the official job vacancy MNNIT Recruitment 2018, Registrar has already affirmed that age relaxations are permissible beyond the upper age limit i.e. five years for scheduled caste/ scheduled tribe; three years for Other Backward Class (NCL – non creamy layer); ten years for persons with disability; 13 years for persons with disability + other backward class non creamy layer; 15 years for persons with disabilities + scheduled caste/ scheduled tribe and special age reservation for ex-servicemen. There is one vacancy each for Network Assistant and Systems Administrator post. Age limit in both the cases is almost the same i.e. below 35 years preferably. While there is a huge gap between the consolidated remuneration of both the posts which is Rs. 32,670 per month for Systems Administrator and Rs. 23,980 per month for network assistant post. From network assistant, desirable qualification and experience required are an experience in managing CISCO switch LAN and wifi access points. While Experience in managing and configuring routine/ switching of Cisco devices, Wi-Fi access points, firewall configuration & Linux server administration, preferably CCNA and RHCE certificate is required as a part of Desirable Qualification and Experience for System Administrator post.